We provide Construction Services for some of the world’s most successful companies. Our experience includes new office buildings, interior fit-out construction, security upgrades, audio visual as well as corporate dining renovations. Irwin & Leighton has has managed more than 8 million sf of construction for the educational sector. 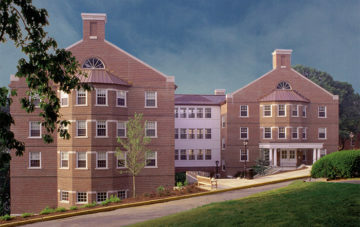 We have completed countless fast track projects over the “summer break” and have built over 3500 beds in new state of the art residence halls over the last 15 years. As well, we also specialize in constructing new dining halls and serveries, laboratory space, classrooms, libraries, performing arts space and more. We understand the complexities of building and renovating facilities within busy occupied campus settings and excel at being valuable team members! For over 100 years Irwin & Leighton has been building and renovating major healthcare facilities. It is part of the fabric of our Company. We understand the sensitivities in working within healthcare environments. Irwin & Leighton brings over 60 years of retail and hospitality experience with over 50 major retailers to bring your latest vision to reality. New Store, Walmart Stores, Inc.
Xfinity Live! Philadelphia Renovations, Xfinity Live! Since its founding in 1909, I&L has provided quality construction services and has established a standard for performance with integrity that is the foundation of the company’s relationships with customers, architects and engineers, subcontractors and employees. A tradition of accomplishment and a spirit of commitment drive the firm’s operations into the future. © 2019 Irwin and Leighton, Inc. All rights reserved.